I imagine this has been covered before, but I can't find the thread. If anyone knows if there is a thread please post the link. If not, I'd appreciate some tips on how to go about getting a 12v socket installed. For example, where do you put it.. where do you connect it? Pictures would be great too. there have been others... expect other suggestion. I had mine installed by a Honda dealer. I bought it from West Marine, a boat accessories dealer, so that it would be waterproof. Then I brought it to the dealer. I had it placed below the handlebars, above the gas tank section, on the body of the scooter. The switch for my heated grips was placed next to it, along with the switch for the foglights. I had this all done at the same time, and it wasn't very expensive. Unfortunately, I don't have any pictures right now, but I'll take some this afternoon and post them. I asked my friendly Honda dealer and after thinking about it for a 3 days they said that there is no part available from Honda. Also, the aftermarket one could be installed, with $269 worth of labor! Don, I know there have been two really detailed posts about this before. Apparently they are on the other big Silverwing forum that I have been booted from. I am a BAD boy. DennisB is the one that installed mine and he has detailed installation instructions. There was another poster that had a different approach. I can't remember his name. You can do the work. It is not a big deal if you are slightly inclined to do these kind of things. I am sure another poster here is going to name the forum. I am not. They booted me, so I choose to never promote them. Just call me childish. I love my Silverwing, and this forum. I will help anyone that needs advice that I can help with. If you are close to me, I will even come to your house and baby sit the kids or dogs while you work on your scoot. I talked to my dealer today and he sent me to a marine store to get the right parts. I didn't get a quote (I will), but the shop foreman said it was no big deal... they've done lots before. If the quote is too high, I'll do it myself, with the remote control help of everyone here. BTW my shop has just been bought by a new guy who is a real "bike nut"... he rode a KTM in this year's Paris-Dakar... and almost killed himself. Anyways, it's cool to have an enthusiast running the business. I mounted two 12v sockets. There's a space for one in the left pocket (SWings sold overseas come equipped with a cigar lighter sized socket there). I mounted my first one there. I bought the socket from NAPA for about $8. It fit perfectly. I ran some heavy-duty lamp cord (with a fuse) directly from the battery inside the lower left tupperware to the front of the bike. I only had to remove the left passenger footrest and the windshield garnish. I have fairly small hands so I was (barely) able to get at the back of the socket area throught the small hole behind the garnish. I use this socket to recharge my cell phone and connect my trickle charger. I used the same wiring from the battery to install a Powerlet socket on the dash for my GPS. Can you post any pictures of the finished job... especially the dash mount? I guess what I'm concerned about is.. how do I know where a hole for the socket can be drilled in the tupperware that will have enough space behind it. I used a hole saw to cut the plastic panel and ran a short 10 amp fused wire back to the battery. I can now hook up a solar charger without having to have the pocket unlocked, pump up my tyre with a small compressor, boil my kettle, run a flouro lamp etc etc. The OEM unit in the LH pocket is only rated to 1 amp, so is only useful for electronic equipment. Next: a 6volt outlet to run hand held CB, Hikers GPS, Pillion intercom, and get rid of those pesky AA and AAA batteries. Thanks for those pics. I had never thought of putting the plug up there. I installed a power outlet in the left glove box where it is prepared to go then I put the other one to the upper left of the right hand glove box for my Garmin c300 GPS. The one on the right is a marine outlet so has a rubber cover to keep it moisture proof. This was not my Idea, I take no credit for it. Someone else mounted the second one to the upper left of the removable box. He was very smart to put it there as it really works out well. I put some pictures in my album. Hope this helps. That was where I had originally thought to drill the hole for the socket, but I didn't and still don't know what's behind there... is it safe to just drill through there? I took it to a Honda dealer, and they did it for me. So I can't answer your question directly. Don, I had two installed. One was in the left glove box with the pre-installed punch out. That one was relatively easy to install. I use that for recharging my cell phone. The second one was exactly like the one Emeskay has. I use it for the GPS. There were a few [b]major[/b] things I learned on that one. First, there is [b]plenty[/b] of room for drilling there. The problem was getting my fat hand down there to get the nut on the back of the socket. Also, same problem hooking wire lead to the terminal. We removed the right pocket for access to the area behind the tupperware with the new hole that was drilled. The parking break is there and I can not express how much tension was generated trying to bend my arm and squeeze it into that tight space and not drop the locking nut that had to be threaded on that terminal. I would recommend looking for another place unless you choose to remove the tupperware to allow you to see and reach that area. Someone had pictures showing how they moved it a little higher and another moved it to a flat surface on the dash. A little higher would be good. There would be a consideration for possible moisture if you mount it on a flat surface. I would experiment reaching in and make sure what you can reach. As I said earlier, there is plenty of room to drill the hole, but that is not the only consideration. I really like having mine where they are, but not sure I would try to do it exactly that way again. I use both very often. Wouldn't be the same without either. Don, I had two installed. One was in the left glove box with the pre-installed punch out. I'm definitely going to add one in the glove box. I didn't realize there was a punch out. Thanks! Mandy, the Silverwings in Europe come with the outlet already installed in the left lockable glovebox... go figure. Please will someone tell me if the socket in the cubby on UK Wings is wired through the ignition switch or live all the time. I'm trying to find out if replacement rear wheel from other year than 2002 will work. I just purchased a 2002 and one of the recalls is for rear rim. Also does anyone know how to fix and what is involved the faulty handlebar issue from 2002? 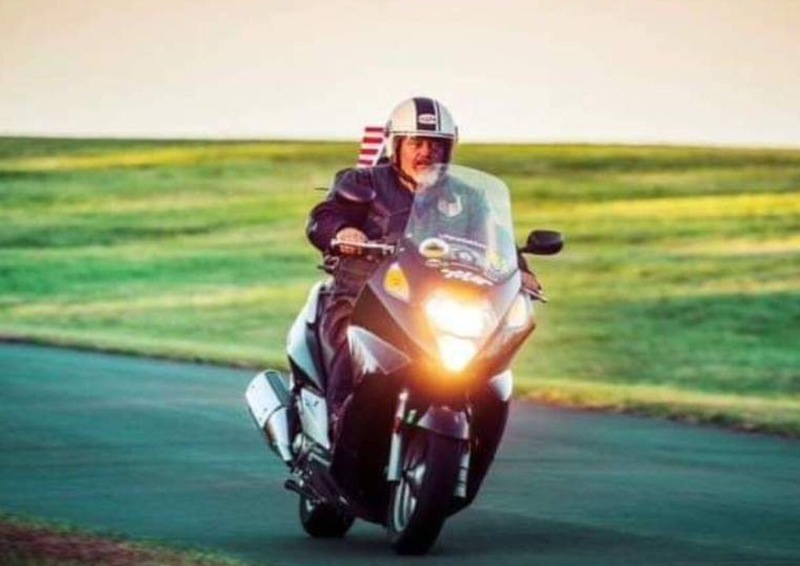 I would take the scooter to the Honda Dealership armed the the VIN number. They can look it up on their computer to see if your scooter has had any recall work done on it. If no safety recall work has been done on your scooter they will do it for you free. Question: I keep reading people here talking about pictures but I don't see any throuought the thread. Am I missing something? P.S. I'm considering taking the right glovebox out and installing a radio, power socket(s) & GPS socket there. Forum Calendar Album FAQ etc. Mike, I've just been to the garage and checked the output from the cigar lighter. It is permanently live. I want to install a 12v socket (which I have ready) near the RH glove-box. I planned to take a spur from the back of the socket in the LH box. Is there any way of getting to that socket without taking the bike apart? I've looked carefully at all the threads but can't find what I want, i.e. the easiest, laziest way of doing it! Or.....is there another suitable source of power close by? I'm not totally unable to do such stuff and have all the proper connectors and tools but hesitate to hack into wiring I'm not familiar with nor strip down lovely new machinery. Hi MikeO, Can you get the left power outlet out of the hole with wires attached? That would make getting to the 12V power wire much easier and getting a wire tap installed would be a snap. You can ground wire off any FRAME screw or bolt. I'd got that in mind but am a bit wary of trying to pull out the socket as, reading other posts, I think it's a push-and-click fit so won't slide out without getting the 'click' bits out of their registers. Hi Don, I installed 2-12volt sockets on my swing, one i installed in the right side access door under the seat, easy access for installation and that way I can charge stuff while riding and not worry about it moving around. The second one for my Sirius Satellite Radio, I made a stainless bracket to mount to the Ball Mount that I bought from this site which mounts in the center of the handle bars. For Power I choose to install a Power Bar & Grounding Block that way only 2 ring terminals on the Battery which gave me room to add 6 more wires which I ran up the left side of the bike by removing the rear Tupperware and the piece under the foot board. Used a piece of stiff wire to fish my power wires up through the front Tupperware to power my 12 volt outlet for my radio and my GPS. Belated thanks for tips and hints. I drilled three holes; two tiny ones for the self-tappers to fix the socket and a larger one through which to feed the wires. On the end of the wires I fixed a chocolate-block connector and into that more wire attached to a plug which goes into the standard socket inside the cubby. I made a gasket from gaffer tape and sealed the big hole with silicone sealant. The wires are clipped with self-adhesive cable clips to the underside of the lid. It looks and works fine and should something unforeseen happen, I have only to replace the lid to bring the bike back to 'normal'. I'll take some pictures in due course and put them in my album. Hope this is of use to someone. Quick, simple solution for having GPS and cell phone power on a made-for-America Silver Wing with empty power socket. Get a Battery Tender Jr. It comes with a yoke you screw on to the positive and negative terminals on the battery for trickle charging. It's around $25. Battery Tender also sells a female receptor (cigarette lighter socket) for $8.99 that plugs into the yoke. Plug a USB male cigarette lighter insert into the female receptor and voila, you can charge your phone under the seat. It charges anytime the battery is on; no need to have the engine running. 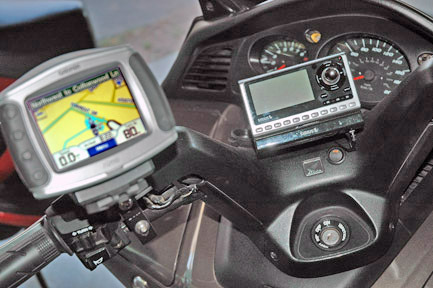 Or, if you want power for GPS, but don't want to do the wiring from the battery to the empty power socket in the left glove box, plug the GPS into the female socket and snake the GPS cord under the front of the seat, then run it up to the GPS on the handlebar. It's a little bit "amateur hour" because the GPS cord hangs down and disappears under the seat, but for me, that's fine. I don't use a GPS often enough to be fussy. Like I said, quick and easy if you want to create a power source for your various media.